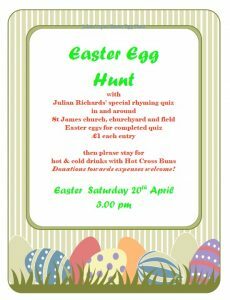 with Julian Richards’ special rhyming quiz in and around St James church, churchyard and field. Easter eggs for completed quiz - £1 each entry. Then please stay for hot & cold drinks with Hot Cross Buns.